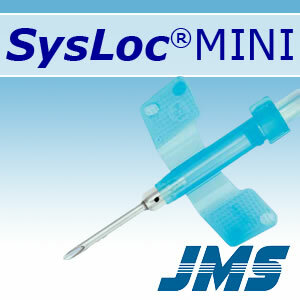 SysLoc Mini is over 20% shorter than the previous model providing easier use. In order to release the lock, pinch the lock and back notch between your thumb and index finger while flipping open the lock. External lock released, ready for needle retraction procedure. Place both the index and third finger on the gauze directly in front of the front notch, make sure that both fingers are on the puncture site. Retract the tubing by pushing forward on the back notch with index finger and pulling tubing with thumb and third finger. When fully retracted, the hub will lock to the SysLoc wing sheath with an audible "click"sound. The needle is fully secured inside the wing sheath after the final lock mechanism has activated. Remove wing from puncture site. Primary locking mechanism is already activated, ready for disposal. Place index finger behind the front notch. While placing your index finger behind the front notch, grasp and pull the tubing, retracting the needle into hub.